No matter how much you love your life, your family & friends, your work, yourself, there will come a time where everything just feels like its wrong. This feeling can last for a day or two, or years, and it can be serious, and you may need professional help to get through it. I am not that professional help – I am not a doctor of any kind – but I’ve been there. In my teen years, I struggled with moderate depression, although looking back on it, my life was pretty fantastic. Over a few years, I was able to move through it with the help of doctors. Since then, I’ve gone through periods where I probably should have seemed help again, but went it alone, often gaining weight, as food was often my way of dealing with it. Earlier this year, I found myself with my life crashing down around me, or at least it felt that way. I’d left my life in a storage unit, and moved 2000 miles for work. After the first couple of weeks I realized the job I had moved for was not what I thought it was, and was very unhappy. My only solace came in the fact that it was temporary – a 6 month stint before being moved again – and that I still had my boyfriend of 5 years to talk to at night, and see occasionally on weekends. And then it happened. My second trip up to NYC to see him, he ended it. I was sad, and angry, and more than anything did not want to go back to my corporate apartment and an unsatisfying job. Since I really had no choice, I returned, took a couple of days to be really sad, and then reminded myself that I was still training for a half-marathon, and quickly decided to use that as my outlet. Over the last 2 months I’ve realized that while I thought I had been happy, I’d really just been content. 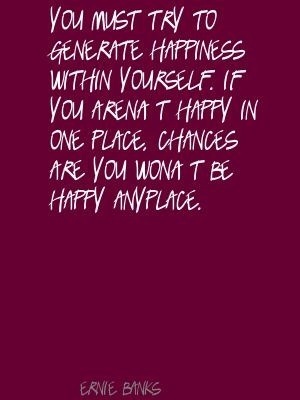 Through my focus on running, yoga, and being healthy, I’ve found my happy, and it comes from no where but within myself. Starting my blog has helped me work through this, and found others that share my struggles and without really knowing each other, provide positive thoughts and reinforcement. See how happy sweat makes me! It’s also helped me learn to use the new job and new city to my advantage. I can learn new things, meet new people, and explore new places. I’m about to plan my second solo vacation in 3 months, and am so excited to see what comes next. For this Therapy Thursday, I say learn to find your happy. What drives it? And how can you make sure you’re happy as often as possible! ?